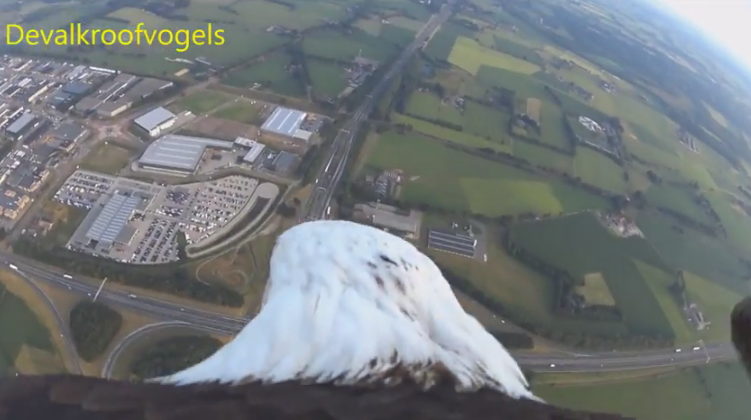 A six minute video shot by a miniature camera and showing the flight of a white-tailed sea eagle over Gelderland is a new internet hit. The trained bird was taken into the sky by hot hair balloon and released at a height of 700 metres to fly back to falconer Gerard van den Brink. During the flight, which covers a couple of kilometres, the bird glides over Barneveldt and the A1 and A30 motorways before dropping sharply to meet Van den Brink. White-tailed eagles are among the biggest birds in the world with wingspans of up to 2.5 metres.